Presented in 2009 for the first time, the Titanium Bridge collection has established itself as a reference model, a signature watch blending aesthetic appeal and top-flight mechanics. Unique in the world, this understated merge of modernity and elegance features a perfect balance between design and technology. The Titanium Bridge models, with their distinctive curved tonneau case and horizontal baguette movement held by bars, are a contemporary interpretation of the Golden Bridge spirit. 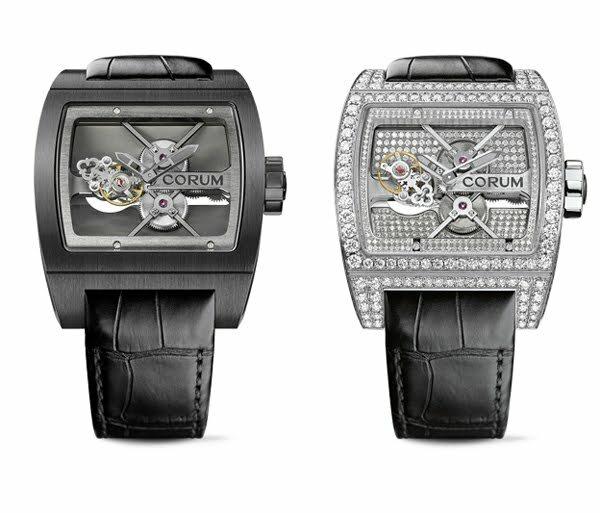 Corum dresses its new Titanium Bridge Tourbillon with a black coat - color of understated elegance. While the grey titanium version was presented with a polished case, the all black model features a satin and black PVD finish. The flange, the plate and the bridges crafted in “ARCAP” are coated with black ruthenium. The deep black entirety highlights the grey key of the flying tourbillon, emblem of the brand. Water-resistant up to 50 meters, the tonneau-shaped case bears generous dimensions: 42.5 mm by 41.5 mm. Cut from titanium, the case gives pride of place to the caliber and its moving tourbillon, visible from all sides, including the case-back. The Titanium Bridge Tourbillon Black will be issued in a limited edition of 50 pieces.